I love that hand-stamped ring. I wear it 24/7—while I shower, while I sleep, at the gym, at work—you name it, I'm wearing it. It's from The Vintage Peal and it warms my heart every time I see it because it's personalized for me. It says "love - faith - hope - laughter - family - sauce," which—to me—are the most important things in my life... the sauce, if you will. 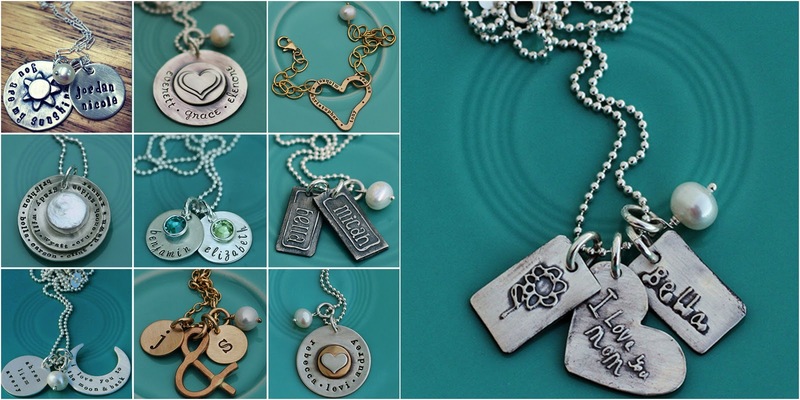 I think one of the most beautiful gifts to give (or receive) is personalized jewelry. With Mother's Day right around the corner (May 12), now's the perfect time to start thinking about what piece you could customize for your mom. One of my favorites from TVP is the "Love Notes" piece. They take your child's handwriting or artwork and turn it into a beautiful charm for you to keep forever. What a cool idea! One example is pictured below on the right. Today The Vintage Pearl is giving away two $50 gift cards, just in time for you to spoil your mom for Mother's Day, or for you to customize a piece for yourself! Enter below (open internationally) & good luck! I love the skinny rings and wrap ring! Actually, I just love rings in general, but these are my favorites! I LOVE the wrap ring more than I can say. 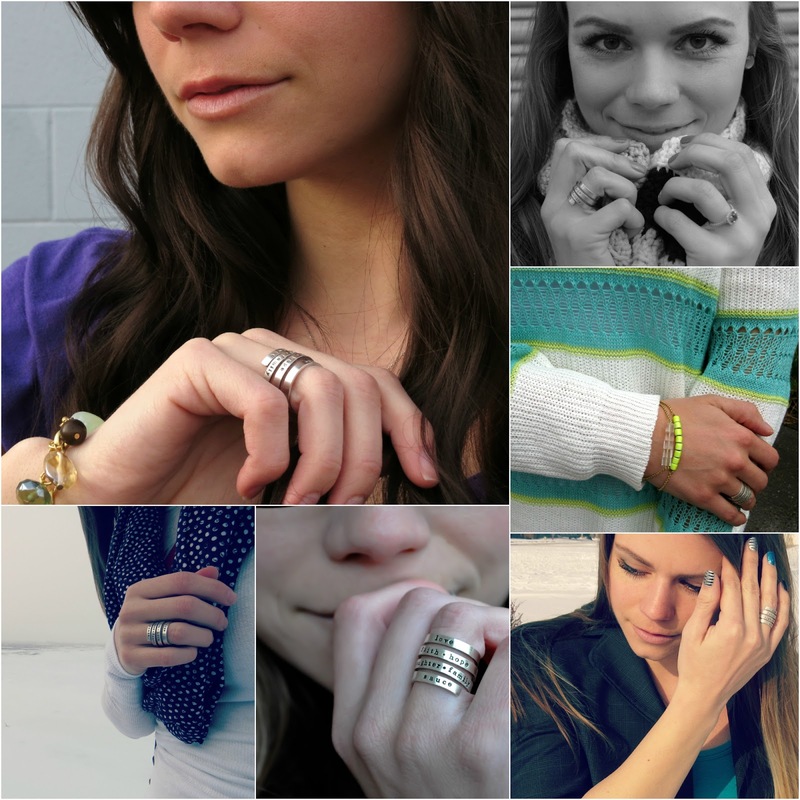 I LOVE LOVE LOVE the wrap ring! I would be getting my aunt a mother's day gift because my mom wasn't around to raise me. It was just me and my dad ( I usually get my dad a mother's day gift too) and my aunt was always there for me. She would love almost all of those bracelets! I love The Vintage Pearl SO much! I would love to get one of the new necklaces from their Gold Line! I love the skinny message ring! I love the new gold line, so much pretty. Love this! Ever since you posted your first photo of your ring I've been wanting to get it for my future Mother-In-Law with all of her son's names on them (4) to be exact! It'd be such a special gift to her! I would LOVE to win a gift certificate from them! Their pieces are beautiful!! I love this! I JUST posted on twitter about wanting a locket, but I think I like these even better. Thanks girl, you always find just what I'm thinking. I know exactly what I would put on it: "I Love You To The Moon and Back"
Love the "Mother of Pearl" necklace! I think I'll get that one for my grandmother on Mother's Day with all of her grandchildren and great-grandchildren's names. So sweet! I like the initials charms. So cute! Love the Vintage Sorority Necklace. Also love the ring you have too, I love it when you can customize things like that. I would love to give my mom the single pearl drop earrings for Mother's Day! I'm in love with the "messy nest with aqua eggs" necklace! I would love to give my mom the Christmas ornament! I love the "carefree" necklace! I want a ring just like yours! I love the secret keeper necklace so pretty! Thank you! I love the simple "names on a chain" necklace! I think the birthstone rings are my fav! I love the round necklace trinkets that have the birthstone and a word like love or laugh etc.. This is awesome! I would love to get Wyatt's name on one! I love the wrap ring! I love the secret message ring! I love everything! But Golden Love is one of my faves. Have I told you enough times that I am in love with your dark hair? So so pretty on you!! I love the necklace with the initials and "&"!